Via Casitas Slide Repair, consisting of construction of three large grade beams and installation of seventy tiebacks at three levels to stabilize a toppling hill that supports condominiums. Madrone Avenue Slide Repair to stabilize a hillside supporting residences through construction of a sculpted shotcrete surface, held down by 32 soil nails, as well as by hydroseeding. Hillcrest Avenue Storm Damage Repair, consisting of the removal of an unstable soil cornice on a hillside; redirecting of the street flow by reversing the pavement’s superelevation; construction of a V-ditch and junction boxes; and piping of the flow and discharging it into the city system. Magnolia Avenue Slide Repair through excavation of a slide area and replacement of the hillside’s soil with rock riprap, a 6-inch thick layer of topsoil, and jute mesh and hydroseeding. Larkspur Marina Water Intake System Repair through slip-lining two new 20” diameter HDPE pipes through old CMPs, construction of passive water intake systems supporting fish screens, as well as two vaults with weirs in the street for control of the water level in a local marina/lake. CIC finished monitoring the construction of three of the projects and turned two, the Marina and Via Casitas, over to the City staff for completion half way through the process. In addition to the Contractors, the firm worked with the geotechnical engineers and the design consultants, and organized the project documents for another consultant facilitating the FEMA/OES reimbursements for the City. This is an HBRR (now HBP) project, including three bridges in the City of Larkspur. 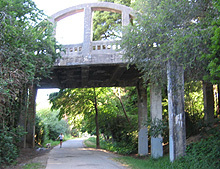 The bridges are Bon Air Road Bridge over Corte Madera Creek, Doherty Drive Bridge over Larkspur Creek and Alexander Avenue Overhead, a historic concrete arch bridge. 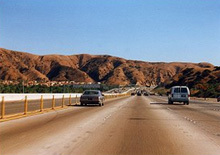 Currently, California Infrastructure Consultancy assists in managing the project for the City. Initially, Mr. Tamannaie was selected to help to revive a project within the City's Capital Improvements Projects that had been delayed because of staff unavailability. As a Project Manager for the firm of Wood Rodgers, Mr. Tamannaie provided a full range of consulting services, including NEPA/CEQA documents and PS&E for replacement, rehabilitation and seismic retrofit of the three bridges and modifications to their approach roadways. In addition to environmental staff, the team of subconsultants managed by Mr. Tamannaie included traffic, roadway and bridge, public outreach, surveying, landscape and bridge architect professionals. Currently, most of the same Subconsultants are being managed by the firm of PB, Inc., while CIC handles the project for the City. Mr. Tamannaie was responsible for leading the design of the structures in the Laguna Interchange, as well as the El Camino Real OC, for the Eastern Transportation Corridor (ETC) Toll Roads project. The double interchange constitutes the union of the State Route 241 with Interstate 5 and State Route 133, and involves 11 bridges. The project included three complex connector structures, three route separation structures, two undercrossings, two railroad overhead structures, and two overcrossings. Tieback walls, Bridge Advance Planning Studies for future HOV connectors within the interchange and design of other miscellaneous structures were also included in the effort. Design challenges included development and incorporation of leading-edge seismic design criteria, tight construction within utility corridors and a fast track schedule. Value engineering was applied to the original design concepts, resulting in innovative designs and substantial cost savings. Because this design-build project was built in fast-track and tightly planned stages, the magnitude and complexity of the project required close coordination of work with other disciplines and the Constructor. The design was reviewed and approved in record time by several oversight agencies including Caltrans and TCA. This project has won numerous awards from professional societies. Mr. Tamannaie led three multi-bridge projects for VTA and its predecessor, SCCTA. He was Bridge Project Manager for addition of three new structures within the existing Route 17/85 Interchange in the City of Los Gatos. These included a direct connector over Route 85, a cut-and-cover tunnel and a ramp bridge over Route 85. The challenge of the design was to keep the structure profiles low, fitting them within a tight interchange, maintaining Caltrans standards and designing around significant utilities, all of which were overcome successfully. Mr. Tamannaie's second project for VTA was the widening and seismic retrofit design of three bridges on the State Route 152 in Gilroy. These bridges are: Route 101/152 Separation, Llagas Creek Bridge and Old Llagas Creek Bridge. Full hydraulic studies of the old and new waterways of the Llagas Creek were included in the project. 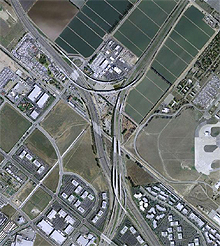 Mr. Tamannaie managed the design of additions to the SR 237/I-880 Interchange, located in the cities of San Jose and Milpitas. This project, funded jointly by Caltrans and local agencies, involved Mr. Tamannaie’s firm in the design of two interchange structures for Caltrans and a bridge over Coyote Creek for the City of Milpitas. The project team was composed of multiple civil and structural consulting firms, requiring close coordination and uniformity in all aspects of the work among the consultants as well as the public agencies. Mr. Tamannaie served as Project Manager for his firm's portion of this fast-track Caltrans project, funded by LACMTA for completion of SR 30 in norhern Los Angeles county. The project included 15 bridges, five of which were assigned to Mr. Tamannaie. These included two bridges over existing channels under the jurisdiction of the US Army Corps of Engineers (USACE), two overcrossings, and a major flume structure carrying the Marshall Creek over the future freeway. The latter is a unique, complex, and large self-supporting prestressed concrete box structure carrying truck traffic on top and the load of the existing floodwater channel severed by the freeway alignment. The flume was designed to meet USACE's more strict hydraulic, structural and seismic criteria. Another overcrossing was designed to carry large volumes of local streets storm runoff in two of its box cells. The project involved multiple consultants and was accelerated to meet Caltrans's commitments to the local agencies for operation of the facilities prior to construction of the depressed freeway. As an Associate Bridge Engineer at Caltrans Division of Structures, Mr. Tamannaie was involved in designing the structures for Route 65/80 Separation when Route 65 first gained freeway status. Nader designed one of the twin two-span structures over I-80, as well as the substructure and foundations for East Roseville Viaduct, the long and complex twin structures spanning over UPRR and other local toads and development. These bridges are cast-in-place prestressed concrete box girder bridges. Mr. Tamannaie was the Project Manager responsible for development of PS&E for widening of five structures including two railroad overheads on State Route 91. The project included complete seismic analysis of the existing structures. One of the railroad overhead structures was determined to be seismically deficient and was retrofitted during widening. Due to lack of falsework clearance, the superstructure of one bridge, Serfas Dive Undercrossing, was constructed above final grade and hydraulically lowered into place. The project required coordination with ATSF Railroad Company, C&M Agreement and PUC application. Mr. Tamannaie was the Bridge Project Engineer for Murphy Road Low Water Crossing over Pajaro River in the rural part of the county. The facility, prior to the bridge, was a temporary embankment that allowed low volumes of water through two culverts but flooded with larger runoff, resulting in the closure of the road. 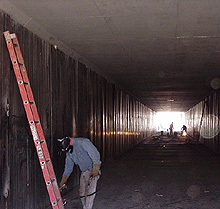 Initially, this HBRR (now HBP) project consisted of a series of permanent culverts that would allow more water through. However, after further consideration given for better fish migration and through a value engineering process, a slab bridge was proposed and designed. The three-span slab bridge was expeditiously designed and constructed within a short available season.